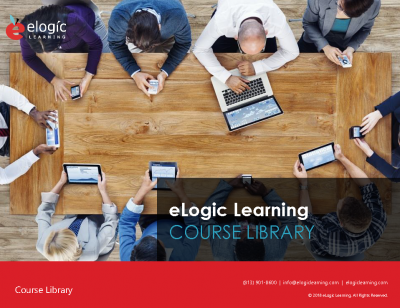 eLogic Learning has a training library that is unrivaled in the industry. With award-winning programs on OSHA, HIPAA, DOT regulations and general business, we have all of your learning & development needs covered. Our library features an assortment of media including video (optimized for mobile learning), full-length HR training, “bite-sized” skill-building courses, training “toolkits,” and much more. eLogic partners with the best content publishers in the industry to provide training on almost any topic related to business or development. The courses can be delivered and tracked in eLogic’s eSSential LMS, or in any SCORM-certified learning management system. Click the download button below for a full list. READY TO CREATE A WINNING E-LEARNING STRATEGY? Contact us today to discuss your learning needs and objectives. We will work to create a custom solution that works for you.